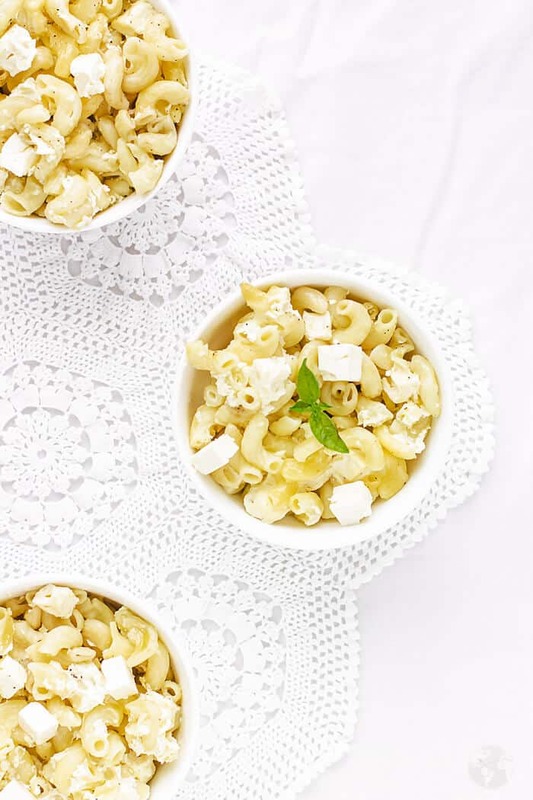 This 5-ingredient Mediterranean feta mac and cheese is the perfect solution for when you crave a fresh twist on the old classic. 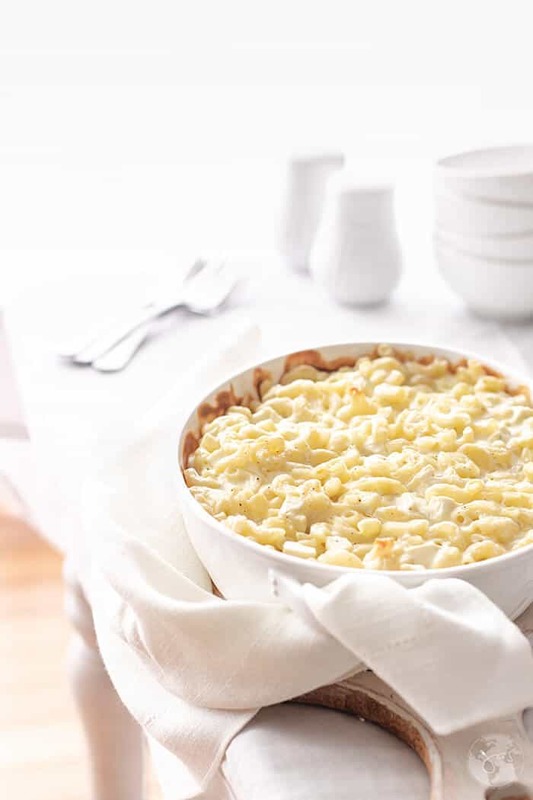 It’s simple, light, delicious and satisfying on its own, but it is also excellent served with chicken, pork or steak for a meal your whole family will love! Welcome to Noodles Without Borders! Noodles without Borders is a monthly challenge that Bobbi from Healthy World Cuisine and I started doing in August (can you believe it’s October already?). We each share a pasta recipe on the first Tuesday of every month. Otherwise, the rules are that there are no rules. Bobbi shares yummy noodle recipes that nourish the body and I think mine feed the soul. You must agree, it’s a perfect combination. If you love noodles as much as we do, tag your recipes on Instagram with #NoodlesWithoutBorders. Make sure you check out Bobbi’s One Pot Creamy Kale Pesto Pasta. You’ll love the colors and flavors! Anyone for Macaroni and Cheese!?! Speaking of nourishing the soul, who didn’t grow up eating macaroni and cheese? A favorite childhood meal, there’s something uniquely comforting and harmonious about warm pasta with cheese. Boxed mac and cheese wasn’t a thing when I was growing up, nor was the pre-shredded cheddar. But in our fridge, there was always a block of feta bathing in brine. I recall the cheese being much tangier and saltier back then and mom used to rinse it before adding it to her dishes. Always taste your feta before adding salt to mac and cheese. As my mom would say, it’s easier to add more salt than to remove it. This traditional Greek cheese is widely enjoyed and indispensable in Mediterranean cuisine. It has less fat and calories than most cheeses. FETA contains vitamins A, B, and K, iron, magnesium, is good for bones, and its good bacteria can strengthen the immune system. Originally made from sheep’s and goat’s cheese, it has sharp and robust taste and creamy texture. Feta is a mandatory ingredient in many salads, but also in appetizers, main courses, and deserts. It is excellent in combination with olive oil, basil, oregano, or grilled, as well as in salads with watermelon and mint. 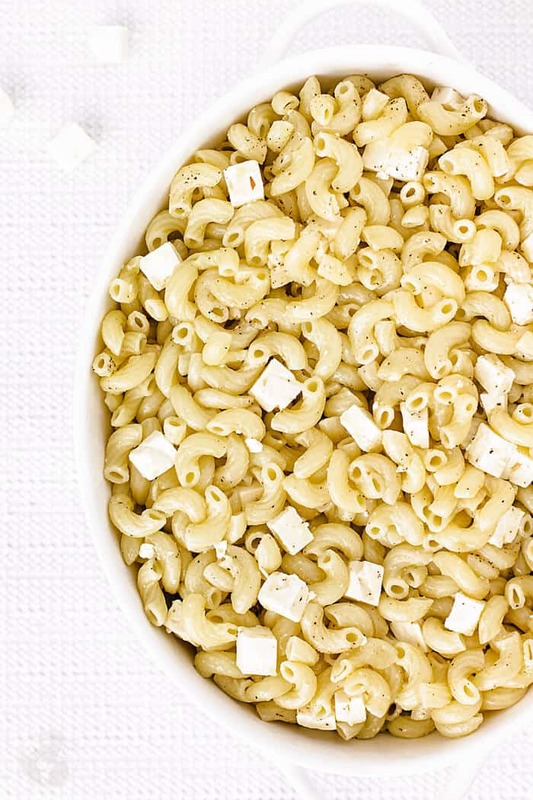 If you’ve never tried feta in combination with pasta, you’re missing out. 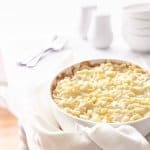 Healthier than the classic mac and cheese with heavy sauces or fake cheese, this Mediterranean-style baked macaroni and feta dish is still very much comforting and satisfying. Best of all, it only takes five ingredients to make. Sub the oil with butter. Use any type of small pasta. It works well with whole wheat and gluten-free pasta. Bring a large pot of lightly salted water to a boil. Cook elbow macaroni in the boiling water, stirring occasionally until cooked through but firm to the bite, 8-9 minutes. Drain. Spoon the macaroni into a 2-qt. baking dish. Add oil and feta and stir to combine. Mix the egg and sour cream; season with salt and pepper to taste. Spoon the mixture over macaroni. Bake for 30 minutes. Enjoy! 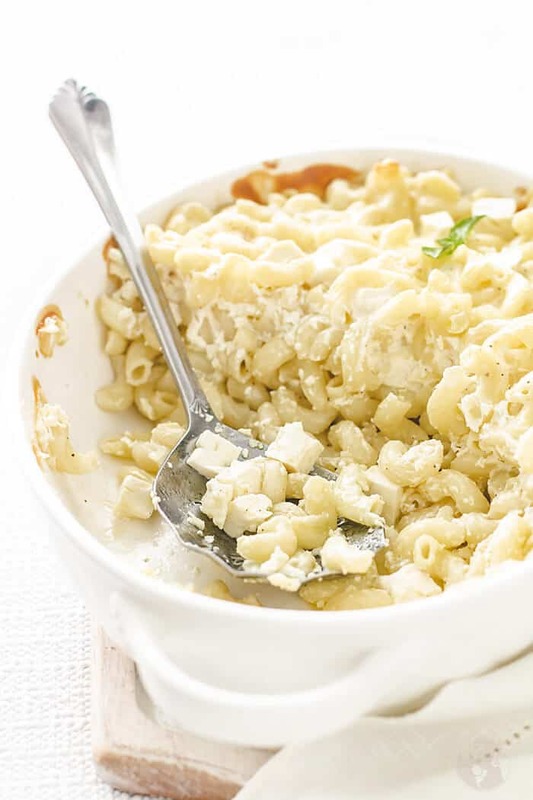 A fresh twist on an old classic, this Mediterranean mac and cheese with feta is light, insanely delicious, and easy to make. 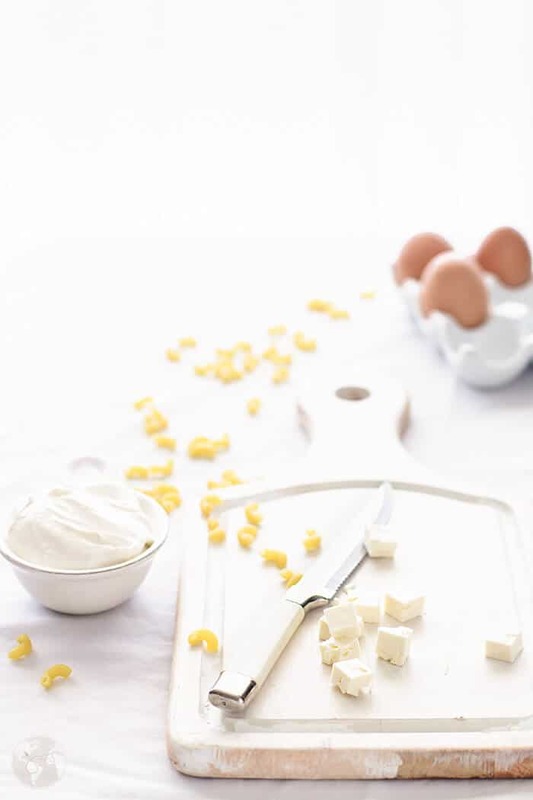 Mix together the egg and sour cream; season with salt and pepper to taste. Spoon the mixture over macaroni. Bake for 30 minutes. Enjoy! Featured on The Lazy Gastronome, B4 and Afters, City of Creative Dreams, and The Cottage Market. Love these quick and easy recipes Jas! A family favorite for sure. Just saved to all of our favorite pinterest boards. Thank you, Bobbi! Perfect for those lazy days (which I have way too often, lol). Hugz! It’s really simple yet delicious. Thanks for stopping in and pinning, Jennifer! Jas, we always have either Greek feta or goat cheese in the fridge. We enjoy it on salads in spreads and pasta, but I’ve never made mac cheese with it. Lovely idea and one I must try. YUM! I can’t wait to try this, it looks amazing! Thanks for sharing! I have a stack of mac and cheese recipes but don’t think I have one with Feta cheese. I’m sure your version is good as I do love Feta! Good to see you once more at the Fiesta Friday party. This looks and sounds amazing! Thanks for sharing at the What’s for Dinner party! Have a wonderful week and hope to see you at next week’s party too! I rarely make mac and cheese, but this sounds delicious! Thanks for sharing with SYC. I prefer this one over traditional but the grandkids, of course, are all for the boxed mac and cheese, lol. I love feta cheese as well! Never tried to put it in Mac & Cheese though..
We will love the seasons in your awesome Mac N Cheese! Thanks so much for sharing your post with us at Full Plate Thursday, we have really enjoyed it. Hope you have a great day and come back soon! This sounds so good. I never appreciated a good mac and cheese until I became an adult. Thanks for sharing at the Snickerdoodle Create Bake Make Party. And I didn’t have ‘regular’ mac and cheese before I moved here. Thanks, Debra! Man I love feta! Nothing is betta. 😉 Thanks for sharing, I am going to pin this for sure! Hi! Just letting you know that I’m featuring your post at our Best of the Weekend Link Party tonight at 8 p.m. EST. Congratulations! I’ve never had a feta mac-n-cheese, but my mouth is watering. Feta is one of my favorite cheeses, so I know I’ll enjoy eating this. Whoa, I just ran across this at the What’s for Dinner link party and I have to say, it looks AHHHH-MAZING. I’ve been on a mac and cheese/all-things-comfort-food myself, so this is PERFECT. 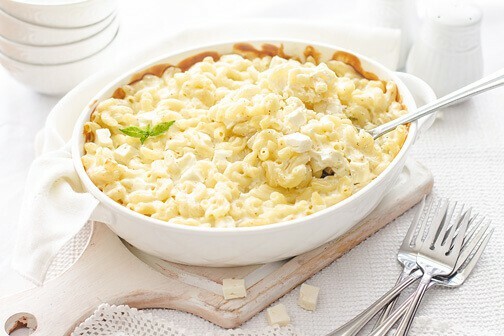 I LOVE feta in mac-n-cheese!! Somebody in my household (husband) ate all of the Travnicki sir (sigh) so I used Dimjleni (smoked) cheese instead. The substitute cheese didn’t melt as much as I thought it would but the taste was good any way. (Next time I’ll hide the Travnicki sir.) The great thing about this recipe is that there is room for desperate interpretations like mine and I can see myself making it as easily in California as I can in Split or Sarajevo. Oh, man! Travnicki sir is the best! How does a Californian find herself in BiH and Cro? Also, you’re making me homesick ❤ Thanks for stopping in! Jas you can bet this one is going on my list of comfort foods to make. We put feta on everything anyway but I never thought to add sour cream to the mix.